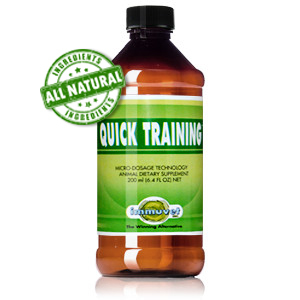 Quick Training™ is a prime quality enhancer of the organic functions. It works primarily in the circulatory system as well as the respiratory and locomotive functions. Quick Training™ helps reduce the risk of tying-up, promote muscle development, and improve physical condition. Quick Training™ is a prime quality enhancer of the organic functions. It works primarily in the circulatory system as well as the respiratory and locomotive functions. This allows the body organs to work together in a harmonious manner increasing your horse’s work capacity. Consequently, the catabolic residues originated from muscular fatigue can be eliminated and the overall endurance and strength are elevated throughout the horses demanding activities. Quick Training™ is specially recommended for horses in training, with lack of or poor performance, loss of strength, cardio-circulatory and respiratory ailments. Reduce the risk of tying-up while in training. Normalize the function of the nervous system. Shake bottle vigorously 10 times before drawing 10ml dose (every time you use it). Give your horse 10ml of Quick Training™ for the first 10 days, thereafter 10ml every other day; preferably on an empty stomach first thing in the morning.